The USDA Foreign Agricultural Service has released its latest update on Livestock and Poultry: World Markets and Trade, forecasting a significant rise in pork supplies. Record pork volumes are forecast to be produced in the US, EU and Canada with producers seeking international buyers in order to export at least part of the gain. Global production of pork is expected to rise by 2% in 2018, to 113.5 million tonnes, largely driven by an increase in production in China, alongside the increase in the US and EU. Steady economic growth means that meat demand is increasing in most countries. EU production is forecast to rise by around 2%, although prices may face some pressure due to weakening domestic demand and a challenging export outlook, due to a reduction in demand from China and a stronger euro. US production is forecast to increase by 5% in 2018 due to higher prices during 2017. Any increase in supply in 2018 is likely to weigh on hog prices, although this will help boost demand from Mexico, Japan and South Korea. The USDA expects the US to increase exports to other markets such as Mexico, Japan and the Philippines, to offset the decline in shipments to China. For the first time since 2012, global trade in beef, pork and broiler meat are all expected to rise. The rise in pork is expected to be modest, just 1%. US exports are forecast to rise by almost 5% during the year, however the recent tariffs imposed on US pork by China may marginally lower total growth. The increase in tariffs will likely price many US cuts out of the Chinese market, with EU, Brazilian and Canadian pork expected to displace US product. Demand from Mexico, Hong Kong, Philippines and Taiwan is expected to grow, alongside growth in South and Central America. Lower pork prices will help encourage demand, as will growth in household incomes. Pork demand has been rising quickly in South America and has been outpacing production. In Japan, the growth in pork consumption is offsetting lower consumption of fish. 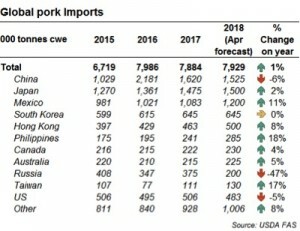 Chinese imports of pork are expected to decline over the year, due to higher domestic production.